JoSAA 2018 Seat Allotment Result for Round 3 has been declared online on 10 July 2018. The Result for Round 3 of Seat Allotment was scheduled to be announced earlier but it was temporarily suspended due to to the proceedings in the Hon'ble High Court of Madras. Candidates can get the Opening and Closing rank (JoSAA Seat Allotment Statistics) detail through the link provided on this page. Supernumerary seats are also provided by officials for females. A notice was released for the applicants who are going to report at the allotted centres for B.Tech admission, one new venue NIT Sikkim is available at Siliguri, West Bengal. Candidates who have qualified in JEE Main or JEE Advanced can register for JoSAA counselling rounds. These rounds will be held for admission to more than 34,000 B.Tech and B.E. seats of the various IITs, IIEST Shibpur, NITs, IIITs, CFTIs and GFTIs. The last date to register for JoSAA 2018 is 25 June. While registering for JoSAA counselling 2018, candidates are required to select the courses and colleges as per their preference. As per the choices entered by the candidate, seats and institutes will be allotted and candidates must visit the JoSAA counselling centres along with the required documents to complete the seat allotment process. After this, candidates will be able to visit the allotted institute to complete the admission process. Go through this page to register and fill in their choices for JoSAA 2018, registration, choice filling and allotment of seats. Until the year 2014, Joint Admission Board (JAB) and the Central Seat Allocation Board (CSAB) conducted their own JEE Counselling to offer admission in IITs, ISM Dhanbad & NITs, SFTIs respectively. From the academic session 2015-16 onwards Common Counselling for IITs and NIT's is being conducted to fill the seats. Latest Update - Seat Allotment Result for Round 3 of JoSAA has been declared on 10 July 2018. JoSAA 2018 Seat Allotment Results for Round 3 announced on 27 June 2018. 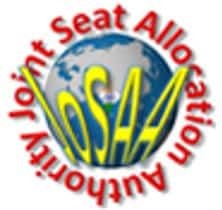 Click here to check the JoSAA 2018 Seat Allotment Results for Round 1. JoSAA Seat Allotment Opening and Closing Rank list was released on 27 June 2018. Candidates can also get the Details related to the JoSAA seat allotment statistics 2018 by clicking on the link mentioned here. The table below provides the list of JoSAA important dates 2018. Candidates are advised to go through them and avoid missing deadlines. First, candidates have to fill in the JEE MAIN 2018 Roll Number and Password. After that, candidates have to fill the required details. Candidates have to click on the academic programs available in the left panel and it will appear automatically in “Filled Choices” on the right side column. Candidates have to fill as many choices as possible to enhance their chances of getting a seat. For the candidates who have qualified JEE Advanced 2018, they can fill all choices. For the students who have qualified JEE Main 2018, they can also fill all choices except those of IITs and ISM. The candidates need to click on the arrange filled choices to modify the order of the preference. Once you have saved, the updated right order appears on the screen. If you wish to delete more than one filled choices, Click Multiple Deletion. Candidates have the option to check all or check only the selected choices to delete from the list. On successfully filling the choices, candidates can either click on I agree to lock my choices and complete the choice filling process and take the printout. After clicking I agree to lock my choices it will ask your final consent if it is final. In order to protect your choices filled, you have to enter your password again to complete the choice filling option. If the candidates want to do any modification of choices filled later, click on I will lock my choices later. The students have to pay the required amount for the final seat booking after the allotment of the seat else the allotment of the candidates will be cancelled. The table below shows the name of the institutes for which the JoSAA counselling will be held along with the number of colleges. What is the reason behind Joint Counselling & Seat Allotment? To provide a Common Platform: The main objective to conduct the joint counselling is to provide a common platform for all the candidates. Hence, the candidates who are desirous of seeking admission in one of India's most popular Engineering will get a single and common platform to apply for admission to IITs, ISM, NITs, IIITs, and other GFTIs. To do away with the Vacant Seats: The second reason for conducting joint counselling and seat allotment is to elude the process of multiple reservations from one candidate. Until the last year, the candidates used to reserve many seats as they can for backup of which the seats at most of the time remained vacant. To ignore any such activities, joint counselling has been introduced wherein students are allowed only to select colleges/ courses as per their choice. Second: Frames the policies and norms for seat allocation to IITs and ISM. The candidates are required to meet the eligibility criteria of JoSAA 2018 to participate in the process of counselling and seat allocation. A candidate will be disqualified if the required JoSAA eligibility criteria is not fulfilled. JoSAA requirement for each category is different which is given below on this page. The candidates should have secured at least 75% marks in the Class 12 examination or either be in the top 20 percentile in Class 12 examination. The candidates must have qualified JEE Main 2018 Paper 2. Candidate must have secured a rank in JEE Main 2018 Paper-2 (B.Arch./B.Planning) and must have studied Mathematics as one of the subjects in Class 12 or equivalent examination. The candidates should have scored at least an aggregate of 75% marks in their Class 12 qualifying examination. SC/ ST/ PwD category candidates should have secured aggregate marks of 65%. If the candidate wants to apply for academic courses at IITs and ISM then too they need to qualify JEE Advanced 2018 and must also fulfil the eligibility criteria regarding the performance in Class 12. The admissions to introductory courses will be open only for the candidates belonging to the SC/ ST/ PwD. The candidates will have to score aggregate marks of 65% in Class 12 qualifying examination. NOTE - For admissions into other institutes of various states, the eligibility criteria will depend upon the admission authorities of the individual institutes. Each institute or state will have their eligibility criteria for admissions. Candidates who have failed in one or more subjects in Class 12 or equivalent examination in 2016 will have to reappear for all the subjects in 2018. In the respective Class 12 Examination, the candidate must hold a position in the list of top 20 percentile of successful candidates. Candidate must have secured 75% (for GEN or OBC-NCL) or 65% (SC, ST or PwD) of aggregate marks in Class 12 or equivalent examination. If the board awards only letter grades without providing an equivalent percentage of marks and if the candidates accept the allocated seats, they have to obtain a certificate from the Board specifying the equivalent marks. If the board gives the aggregate marks after taking into consideration of both Class 11 and Class 12 examination, only the marks of Class 12 will be considered. The marks scored by a candidate in Class 12 or equivalent qualifying examination in the year 2017 will be considered if the candidate does not reappear for the Class 12 or equivalent qualifying examination in 2018 in any of the subjects. For those who appeared in 2018: The top 20 percentile qualifying marks of the respective Boards in 2018 will be considered for candidates who pass the Class 12 or equivalent qualifying examination in 2018 and for those who appeared in 2016 but reappeared in all subjects in 2018 to improve the performance. If in case Board does not provide information about the qualifying marks for the top 20 percentile, candidates are required to produce a certificate from the respective Board stating that they fall within the top 20 percentile of successful candidates. If the candidate fails to do so, then the qualifying marks for the CBSE will be used. In case board does not provide information about the qualifying marks for the top 20 percentile, the candidates are then required to produce a certificate from the respective board mentioning that they were among with top 20 percentile of successful candidates. The required minimum aggregate marks for General and OBC-NCL category is 75% and that of SC, ST and PwD it is 70%. The rank list is prepared and considered for JoSAA counselling. The rank list is prepared for all the eight categories given below. The candidates can know subcategories fall under the given one. OBC-NCL-PwD, SC, SC PwD, ST or ST PwD. given the tag OBC-NCL or OBC-NCL-PwD. JoSAA Rank list for admission to IITs and ISM is prepared on the basis of the performance of candidates in JEE Advanced 2018. The table below holds the information about the rank lists, the minimum percentage of marks in each subject and minimum percentage of aggregate marks. The candidates are suggested to go through the information given in the table below. How will JEE Advanced 2018 Rank Lists be prepared for JoSAA? JEE Advanced Rank list has been declared in the month of June 2018. It is to be known that the candidates who are going to appear in Paper 1 and Paper 2 of JEE Advanced 2018 will only be considered for ranking. The marks obtained by the candidate in Physics subject will be equal to the marks scored in Physics paper 1 and the marks scored in Physics paper 2. The marks for other subjects will be calculated in the same manner. One set of eight rank lists based on the performance of candidates in JEE Main 2018 Paper-1 (B.E. / B.Tech.) and Class 12 or equivalent examination. Another set of eight rank lists based on the performance of candidates in JEE Main 2018 Paper-2 (B.Arch. / B.Planning) and Class 12 or equivalent examination. All the candidates who will appear in JEE Main 2018 will be considered at the time when the Rank Lists will be prepared and they will also be given the permission to fill their choices. The rank lists that will be provided by the JEE Apex Board will be used without any change even if two or more candidates have the same rank. If it would be stated in simple term, JoSAA 2018 will NOT apply any tie-breaking norms/ rules.